We are not single selves, but constantly meet conflicts of desire both within and beyond ourselves. We meet conflict at different levels, from everyday distraction, to the suffering of the addict, through even to world war. The integration of desire is the process of bringing opposing desires to work together, whether at the psychological or the political level. 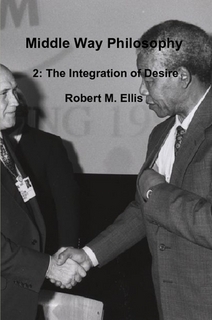 Robert M Ellis here brings together approaches that have previously been separated, drawing on ethics, psychology, philosophy, history, politics, and Buddhism to suggest a common pattern in the resolution of conflict at all levels. This is the second volume of a planned 5-volume series on Middle Way Philosophy, and follows the first volume, which set out an overall philosophical approach to applying the Buddha’s Middle Way in the modern Western context. The Jungian concept of integration is here combined with the philosophical approach of the Middle Way to offer a practical way forward beyond absolutism and relativism. Available in paperback and ebook, and as part of the Omnibus Edition.